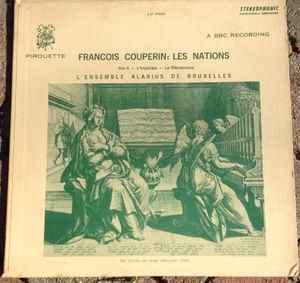 Side One: "Recorded in England"
Side Two: "Recorded in Brussels", "New Formation: 2 Violins, Viola Da Gamla & Harpsichord"
"These recordings [...] were issued as a memorial tribute to Charles Mc Guire. [...] He founded L'Ensemble Alarius De Bruxelles in 1958 [...] He died in 1964 [...] With Sigiswald Kuijken (violin and viola da gamba). The Alarius Ensemble now has a slightly different repertoire [...] The first three orders of 'Les Nations' were recorded by the BBC in London three years earlier. 'La Piémontoise', the fourth order, is a new recording made in Brussels in 1965, featuring the new composition of The Alariums Ensemble: two violins, viola da gamba (or one violin with two gambas) and harpsichord." (back cover). Apart from those named in the quotation above, musicians are not named. "Distributed by Ambassador Record Corp., 145 Komorn St., Newark 5, N.J."